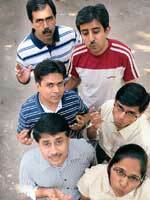 There’s more to whistling than just puckering up, the Indian Whistlers Association tells Amit Gurbaxani. It didn’t matter that there was no nameplate on the apartment in which where we to meet the Indian Whistlers Association one Sunday afternoon. As soon as we got out of the elevator, we heard a familiar tune and we knew instantly which bell to ring. Inside Manoj Karam’s flat in Santa Cruz, six of the 25 Mumbai-based members of IWA’s west zone were rehearsing for their concert at the Kala Ghoda Arts Festival this fortnight. We spent an hour watching Karam, Aditya Kothari, Bhagyashree Pujar, Sharad Karnad, Chaitanya Kalyanpur and Faroque Baig practice such Hindi film classics as “Ek Haseena Thi”, “Yeh Sham Mastani” and “Pyar Diwana Hota Hai”. Together, they comprise only one-tenth of the total membership of the west zone, which includes whistlers from Gujarat, Mumbai and Pune, but they’re each at the top of their game. “We wanted to make sure we have only the best at the festival,” said 44-year-old Karam, the head of the zone. The measures used to judge someone’s whistling are the same one would use to evaluate his singing ability, Karam said. “It’s very easy to whistle without music. But the minute you put on the song, the guy may go out of sync.” One way of appraising your own whistling skills is to play attention the next time you tootle a tune in public. If someone else starts singing, you’re doing a decent job because the listener could identify the song. Since it was formed in Pune in 2004, the membership of the IWA has grown to nearly 400 people for whom whistling is much more than a way to idle away the time. Last July, 48 of them assembled at the first All India Whistling Convention in Chennai to win a place in the Limca Book of Records 2009 “for the largest gathering of whistlers singing the same song”. Their rendition of “Saare Jaahan Se Achha” was just practice for the bigger prize, a spot in the Guinness Book of World Records 2010. “We see this as a serious performing art,” 30-year-old Kothari said. “Aspiring whistlers” who want to become “inspiring” ones need to practise everyday. “It doesn’t matter whether you are home, on the way to office or in the bathroom,” said Karam. Other tips include not smoking and keeping your lips moist all the time, either by sipping water, chewing sweets or using lip balm. One of only five female members in Mumbai, 19-year-old Pujar had a tough time convincing her parents that she wasn’t hobnobbing with a bunch of unsavoury elements. “Her father came to check that she wasn’t hanging out with roadside Romeos,” said 60-year-old Kalyanpur. Pujar’s dad has subsequently begun to indulge his daughter’s serious hobby. Nowadays, he doesn’t bat an eyelid when Kothari, who lives in Malad, calls up their home in Navi Mumbai at 10pm some nights to whistle “Ek Hasina Thi”, his duet with Pujar, over the speakerphone.